AMD is also releasing some Vega information today, much more than with Threadripper. Unfortunately SemiAccurate only had a couple hours to write-up a technical deep dive and specs. This is the long way of saying no chance in hell for the technical info, the time frames were absurdly short and there was no ability to ask questions and get answers, much less in time for the embargo. With that in mind we will give you the simple specs. There is also a limited edition card with a bundle deal that many in the press seem to think is controversial. There you have it, the specs. There is a lot of interesting tech but as we said earlier around the ‘no chance in hell’ bit, there isn’t enough time to tell you about it. If we can get the information we need and people still care about the details, we might bring it to you at a later date. Sorry, this wasn’t our scheduling. 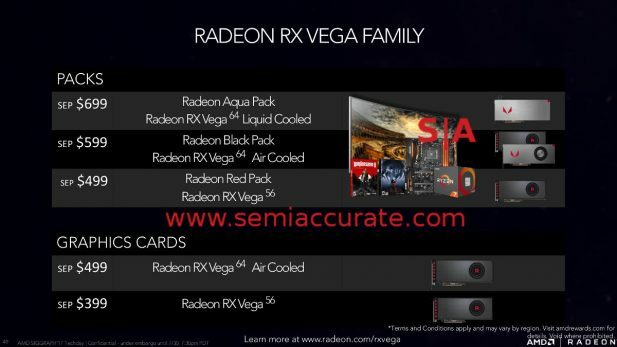 AMD is doing bundles for Vega as you can see above. The spiffy metal shroud cards only come with the bundles, and only then on the top two RX Vega 64 cards, RX Vega 56s and non-bundle boards get a plastic shroud. What are these bundles? You get two games, Wolfenstein 2, Prey, or Sniper Elite 4, depending on region for a start. Then you get $200 off a high-end Freesync monitor, and $100 off a Ryzen 7 CPU and board combo. The catch is you have to buy them at the time of purchase or game over, limit one per address. That isn’t a joke, it really is limited to one per address. There are going to be a bunch of etailers who are part of this deal, more monitors and boards will be added to the options later, and things will change. There is supposedly a web page with links to who has what and availability, but since time doesn’t allow us to get the details, good luck finding it on your own. The idea is to keep coin miners from sucking up supply, or at least soaking them for an extra $100 if they want. 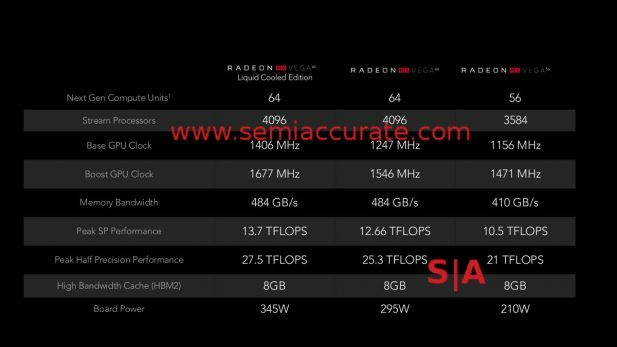 AMD is trying to use the bundles to get more cards into the hands of enthusiasts but if you have a high-end monitor, have a relatively recent CPU and board, and/or have the games, you are going to be fighting the miners for a Vega. SemiAccurate could go into the pros and cons of this idea, mostly pros, but again, no time. So make of it what you will we can’t adequately explain the reasoning behind AMD’s decision and still meet the embargo lift, *SIGH*.